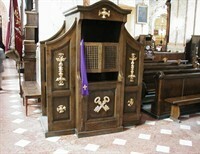 The Sacrament of Confession may be one of the least received Sacraments in the Church today. Even those who go to Sunday every week might find it difficult to muster the courage to tell their faults and shortcomings to their local parish priest. Any other Catholics out there enjoy a good “haunted house” attraction? Of course I don’t lean toward anything occult, but I enjoy some spooky fun pointed at the supernatural (and that includes morally appropriate Halloween celebrations). 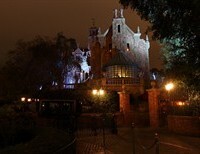 Being a Disney fan, my favorite thing to do when I enter Disney World is to stop by the Haunted Mansion. You could say I am a “die hard” Haunted Mansion fan! 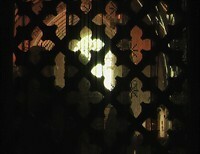 Confession seems to be something seldom practiced in the early 21st century American church. If you’ve been away from this practice for years, the prospect of entering a little room to tell a religious figure all the things you did that you are ashamed of can be daunting (I speak from experience).